Virtual worlds are like real life countries. They are located right next to each other on the virtual map and although sometimes may appear the same, they will have different rules, behaviors, cultures and requirements. The people could be different or the same. They can play and work within both countries or maybe they immigrated from one country to the next in hopes of finding something exciting and new. Possibly they live in one country and have a vacation home in another or they enjoy dual citizenship and live in both. The people that live in these separate countries can accept and welcome their new neighbors with open arms. Without fear, prejudice or hate. To acknowledge their own options of what a new country could do for them and making those choices for themselves. Without attempting to put their choices onto another. Or they can fear having a new country next door will mean less for them, losing friends or alternate lifestyles. They can campaign to try and remove the new country from the map. To slander it with words and false claims. They can wage war on it through blogs and forums and word of mouth in their own country. They can cause undo concern for others and try to put fear into minds that something bad is happening. Each of us have choices with new virtual worlds cropping up on the map and offering alternatives. We can either behave like real world hate mongers and wage war on other VW's out of our own personal fear and lack of understanding someone's need for something different, exciting and new. Or we can become what we wish the real world was...tolerant of others and their choices, accepting that people live and make decisions different from us and by doing so, it does not make them a bad person or mean they are taking away from us personally. Many years ago, Bette Midler released her song "From a Distance" to show her hope for world peace and to remind us that even though we are in different countries and do things differently, fear and hate should have no place in our world. We should remember this for our virtual worlds; we have a chance to be better then our real world counter part and not wage war on each other through hate or fear. "From a distance you look like my friend, even though we are at war. From a distance I just cannot comprehend what all this fighting is for." 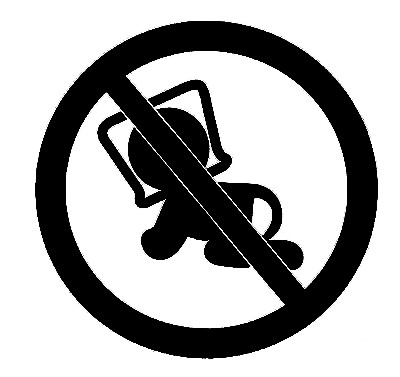 No virtual world is here to take your creators, your friends, your hopes or your dreams. Please don't try to take those very things you fear to lose from others. As a rule, I'm a forum addict. I've been this way for many many years starting with parenting boards then moving on to debate boards and finally into my current interest for the last four years, the virtual world boards. I've watched drama unfold, I've watched personal attacks and I've watched communities gather around each other when times were hard. Basically, I've seen it all. Recently, on the Inworldz Forum Boards, a new trend has started to emerge. Sides are being taken, the subject is discussed through numerous threads and posts. It's on-going, it's heartbreaking, and nobody ever wins. People become upset and those who could be civilized and polite with each other, no longer are. What is this new trend you ask and is it really new? It's called "Telling other Creators what they should and should not do with their business." Although probably not new to some, it is for me and I think that is because it's not consumers telling creators what they would like to see or how they wish to be treated. Instead, it's creators telling other creators how to run their business. The discussions generally start off innocent enough. Someone offers thoughts on how they run their business. Or maybe they ask for ideas that others have found to work for them. Possibly it's about prices and how does one go about deciding what might be a good way to figure out pricing. Occasionally, it's a rant about high prices or poor products. Worse...it involves freebies. Sometimes, a smart person will say "this is only my opinion..." and share details on what works for them or as a consumer, what they prefer to see or how they prefer to be treated. Often, those words are twisted and turned around to accuse someone of telling another how to run their business. However, the above isn't really the issue. What is starting to be seen more and more is creators losing their community spirit and attacking other creators. These aren't out right attacks, by far they are much worse. They are what I call the 'quiet attack' where your not really sure if the creator is addressing your products or another persons. Statements like "Too many business in a box or templates are being used", or more complaining about "big business' opening up their store amongst many other remarks that are being tossed back and forth. These type of comments and jabs are extremely harmful to the community at large. It's true that a very small user base of the Inworldz community participates on the forums. What is also true is that a large portion read the forums, even if they only read them once. First impressions mean a lot and right now the creators of Inworldz are not making a very good or welcoming first impression. What a person reads when they first glance at the forums are the issues surrounding our world, which is extremely open and transparent for a reason. That reason is to let others know that Inworldz is Beta and there are quirks, issues and down right hair pulling days. For many, that would be ok and acceptable. Be it to open a business, or to have a vacation home away from the Papa Grid, or even to take up permanent residence. The other thing they are reading is creators fighting with creators. They are seeing people being called out on the forum for what another deems as poor behavior. They are seeing creators telling other creators that freebies are bad or higher pricing is bad. They are hearing comments about Inworldz sales paying for Papa Grid tier and how that shouldn't be acceptable (but apparently it's ok to use Papa Grid money to pay for Inworldz tier). I'm not sure how any of this equates to the Community Spirit we all say we crave and want. It's not supporting other creators-even if we personally do not agree with their prices, their freebies or how they run their business, we shouldn't be calling them out in the forums. If we, as creators, want to get the Community Spirit back into the forums for Inworldz and make a good first impression that is welcoming to others, then it might be time to subscribe to the "If I can't say anything nice, I should not be saying anything at all" rule of thumb. Does this mean you can no longer state your opinions? Of course not. What it means is to chose your words carefully and, keep in mind, you have an audience. What you type to another could possibly be their first impression of you. If you see something you don't like or feel it's not proper for the forums, by all means state so. Then end it there. Not everything needs to turn into a debate about what's better, or calling each other out on perceived attitude issues, or anything else that will end up with fights and locked threads. We are all in this together, maybe it's time we all started acting like it. On September 1st The founders of Inworldz will start to charge a $75 USD setup fee on the purchase of a new simulator. The tier will remain the same for an island at $75 USD per month. So if you plan on purchasing a sim on the IW grid after September 1st, it will cost you a total of $150 USD for that first month and then $75 USD each following month. Many residents have known about this pending setup fee for months. I remember it being tossed about this past spring, so it is with no surprise that it is being implemented. The justifications for the setup fee are many, as are the arguments against its implementation at this time. While there is never a perfect time to introduce new charges, recent stability improvements makes the proposition of a setup fee much more palatable than it was this past spring. If the founders were to continue to hold off on implementing the setup fees, I believe their ability to support growth would be compromised. The inability to properly support growth wrecked havoc on that other grid and should be avoided at all costs. Knowing setup fees are imminent, may residents have, or are thinking of, purchasing sims before the fees take effect. Many of these residents plan on offsetting the tier expense for these newly acquired sims by renting out parcels. In a normal market this strategy is not only valid but the norm. However, the post September 1st land market will not be normal. On September 1st, the supply of rental properties will be abnormally increased compared to the time period before the setup fees were announced. This is a natural consequence of many new sim owners racing to purchase before the setup fees are enacted. These new owners will now attempt to offset their expenses by offering parcels for rent. Thus adding to an already saturated market, as evidenced by the number of rental advertisements currently in the forums. The status change of these new sim purchasers from renter to owner will only further increase the supply of rental units on the market. For a period after September 1st there will be a glut of rental units on the market and demand for these units will be exceptionally low. One can argue this is the natural state of things. Supply and demand will always balance out in the long run and you would be correct. But, the move to equilibrium, while inevitable, is none the less painful. Many of the people who planned on renting out parts of their new sim to help cover costs are going to be disillusioned when they realize the rental supply vastly out weighs the demand if only in the short run. The question now raised is, when should you buy that new simulator? If you do not plan on using rental income to pay tier then the answer is now, before the setup fees take effect. However, if you will be depending on rental income to offset tier expense, you need to take a second look before purchasing. Ask yourself a few questions: How confident am I in my ability to rent enough parcels to cover tier? Knowing the market, at least initially, will be saturated with properties for rent, what pricing can I reasonably expect to charge? If I cannot cover tier with the rental income, will I still be able to pay the tier on my own or will I lose the sim? The answers will be different for everyone. If you are confident in the timing and your ability to pay tier then by all means make your purchase now. If you have doubts though, I urge you to think twice before plunging into this market. Waiting a few months, while the ever increasing number of new residents eats up that surplus in rental properties, could actually save you more money than acting prematurely to avoid the $75 USD setup fee. Ever get the feeling you are being watched? How about being watched by a group of say, three or four people? You know the feeling I suspect. There you are, busy doing something uber important in your home or shop and then suddenly your pixel self gets a cold shudder. You glance up at your radar but see nothing. You do a quick 360 with your cam and still, you see nothing. Everything is in place. Everything is as it should be, yet you know you are being watched. You can feel it in your core. There are eyes, pairs of eyes, just beyond your sight. Ghosts. That is what I call them at least. It is the ghosts that causes your avi's skin to crawl every so often. Like many unbelievable things in IW, ghosts do exist. Lots of them. Not only do they exist but they are relatively easy to find if you know where to look. I have four of them watching over me right this minute while I compose this post. Don't believe me? I will prove it. Take a look at this picture. There they are. All four of them are here with me and my close personal friend and alt, Yuuka. Yuuka and I are standing all tiny on the ground in the lower right. Actually, there might be a fifth ghost hiding in that lot but I am not completely sure. I sometimes think that some ghosts cannot be photographed but I still have to study that. So now I am sure, you are wondering how you too can have a good-old-time tracking down ghosts. Well you are in luck, for it is really quite simple. Just go to one of the sandboxes and gaze up at the sky. For some reason (I think it is the warm air currents) they seem to like to gather over the sandboxes. On any given day you are more than likely to see at least one or two hovering overhead. So there you have it. Now you know how to spot ghosts in IW. So next time you get that shudder running along your spine or your avi's skin gets unusually clammy, look up. You may just see a ghost watching over you. Some have wasted no time in employing the MLP. The creators over at MUSE! have been working diligently to get their set of animations loaded up into their newest lines of beds. Rumor has it they will be selling in the 2200 to 2600 I'z price range. While for some, this is a hefty price tag, early adopters are use to paying a premium for bragging rights. I am sure that price range will not last long once other creators bring their bed products to market. While the MLP is a very welcomed addition to IW, I would like to remind everyone that the MLP is useless to the average resident unless they have animations to use with it. Right now the only people who can take advantage of this very generous gift to the community are the more established creators with access to appropriate animations. To make this a truly universal gift to the entire IW community, we need animations. It is in this light I would like to invite any and all animators to donate an animation or two to the community that can be used to make the MLP a truly universal gift. I am not calling for a ton of animations to be given away free, only a few so the average resident can have some basic furniture such as a couch, bed or chairs without being beholden to furniture creators. This shouldn't be viewed as a threat to content creators however. The truth is, many residents will be more than happy to buy well crafted furniture. Yet not all residents are in a position to spend even a nominal amount for what is essentially a game. We are bring a lot of ideas, products and customs with us as we migrate from other grids. Let us use this opportunity to import one of the better aspects of the other grids, free access to the basic elements of a virtual world. This should include the ability to make simple furniture functional. Revision McCallen has very generously ported and donated the MLP to the IW community so that all residents can create their own functional furniture. Yet the MLP alone is not enough. Basic animations need to be made available as freebies to complete the vision Revision has started. So if you are reading this and you have the ability to create animations, please consider releasing one or two to the community to use with the MLP. That is the current million I'z question for Inworldz creators. The following post is based on Inworldz issues and personal opinion. It is not meant to tell another creator how to run their business or price their products. I feel that's important to state and important for readers to remember; as often, a personal opinion is turned, by others, into suddenly telling them how to run their business. It's meant as a thinking post, please take it as such. As a past consumer on the Papa Grid, I often bought non-copy items. Rare was it that items were lost: either on rez in my parcel or through inventory loss. Yes, it did happen, and sometimes, for others, it was catastrophic. But it is a rare occurrence over all, which made buying non-copy items a low risk factor. Sometimes price played into a part, sometimes it didn't. Most often it was items that could be given to another once I was done with them. Sometimes they were what I referred to as 'collector's' items and a one time buy that would only need to be rez'd once to complete a set for landscaping, or worn once for a special theme I was trying to accomplish. For Inworldz, I have a completely different outlook on how I purchase my items. Inworldz is a beta sim based on the OS environment with new coding going into effect with each new release. What does this mean over all? Basically, that it can be unstable at times. However, not every creator feels the same, and many do offer non-copy items. Most have excellent customer service and either do not mind or resign themselves to the task of replacing items at the whim of the grid. That is their right to do so but as a consumer, it's hard for me to buy non-copy items unless it's a 'collectors item' and I have past experience with the creator to know their customer service is above standards. Especially if I am purchasing a single item at a high cost of I'z. If I don't know the reputation of the creator, then I have no idea if they are going to replace the item if it is lost on rez or through a grid glitch. I have also seen occasional "not responsible for grid glitches" signs. Which is a complete turn off from purchasing anything by that particular creator. I often feel that when setting an item, especially items that people place onto their properties, as non-copy...I am being price gouged, with a few exceptions. If I want more then one copy or more copies then the pack allows, I have to purchase the product again, at cost. Yes, real world stores work this way as well. If I buy a plant, I can't just rez a new one from my inventory in the real world. I understand that. However, I also don't advertise your plant for you with grower information. Not unless someone asks anyway. This is where real world and virtual world differ. Wandering a grid and coming across your item on my parcel, with a simple right click/edit, anyone can see who the creator is and go to purchase their own. I take that into consideration when purchasing no-copy items. If they are expensive and not 'unique' (i.e. something similar can be bought through another store at a lower cost and/or with copy permissions) I generally won't purchase. That is based on my own theory of cost versus value. What cost am I promoting to grid wanders versus the value they receive for the item? If it's not a unique item and it's not copy, there isn't much value in purchasing it. I can get similar elsewhere for less and that gives it value. The question asked, to copy or not to copy, has not been answered. Each creator must make that choice for themselves. They must base it on how much customer service they are willing and have time to offer, and whether or not their item is unique enough to have value based on non-copy and cost. It's a hard decision and one creators deal with on an on-going basis. I am wrong. I suspect I may even be dead wrong but I cannot help it. It just doesn't seem right to me and I have to say something. If I keep this bottled up inside me I am sure to explode like some hapless alien meeting the business end of a plasma cannon. That isn’t the ending I want. I want to die mostly intact so I am going to just say it and hope for the best. Forcing your customers to pay twice for an asset is wrong! I don't care what you say. It is wrong. The funny thing is, if my shop actually had sales, I would be doing the same thing. Yesterday at least. Today I turn over a new leaf. From this moment forward, I will never ask a customer who has purchased one of my products to again purchase it on a new grid. Crap!! What did I just say? Am I Mad? I think I just shot myself in the foot, financially speaking. Isn't it common practice to double dip when your customers change grids? Don't I reserve the right to decide when and where the content I have created is use? Some might even say I should even be able to control how it is used. So why not charge my customers twice for the same asset? After all, if the market doesn't like it, it can go shop someplace else damn it! Unless of course I am the only supplier. Then they have to play by my rules. My sandbox, my rules! When the majority acts in one way, we tend to accept it. There is science behind group think and we have some understanding as to why we demonstrate an inability to personalize large numbers. But even at the extreme, when those numbers reflect horror as in the case of Darfur, we quietly follow the pack. We often know the majority's inaction or lack of outrage is wrong yet we cannot muster a voice against the wrong doing. Pay twice for that asset if you must, rationalize it anyway you need too as well, but in doing so just for a second, try to remember your double purchase is supporting what I believe to be an injustice, albeit a tiny one in the big scheme of things. 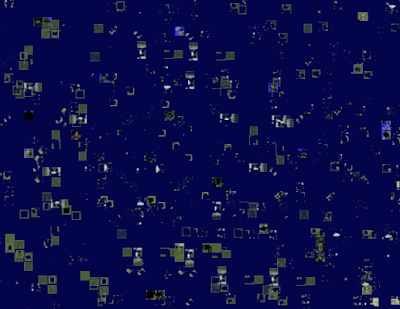 Many a refugee from other grids, myself among them, have found a home here in Inworldz. While we are all individuals with unique experiences, I have noticed a common thread running though the community. A thread which intrigues me to no end. 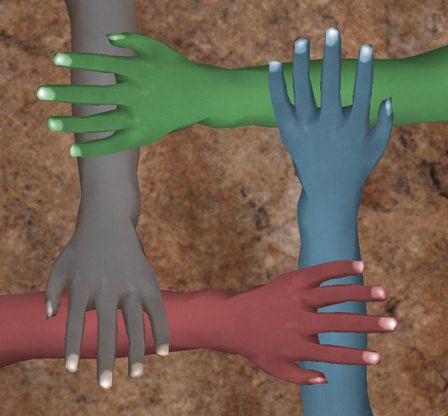 I am speaking of the general altruistic nature of many individual residents of Inworldz, and of the community as a whole. Anyone who comes to know me realizes quickly that I am a cynic by nature. After all, we are all products of our environments and wear our spots, like it or not. So when I ran into Scotsgraymouser Janus on my second day in Inworldz, I wasn't sure how to take her. She was warm and good natured, as most acquaintances are upon first contact, so this didn't alarm me- but what followed did. Having spoken to me for all of 15 minutes, mouser, as I have come to refer to Scotsgraymouser as, offered me unlimited access to her sim with full rights to build whatever tickled my fancy. Naturally, I hesitated while I tried to find her angle, but I came up empty handed. For the life of me, I could not figure out what mouser's game was, nor could I see the catch that would indebt me to her. So I uncharacteristically took a chance and agreed to follow her to her sim, Equilibrium. It was at Equilibrium where I was given the time, space, and most importantly, the freedom to discover my path in Inworldz. Mouser quickly set me up on a floating island and then simply left me to my devices. That is it. I remember still questioning mouser's motives when she left me standing on that floating island. It wasn't until I watched her mentoring at the welcome center and had several brief exchanges with her that I realized her true motivations. Mouser subscribes to an alien, to me at least, notion of altruism. Mouser asked for nothing and expected the same. Later when I asked why she does what she does, she didn't answer me directly but I understood. She does this because she enjoys people, enjoys Inworldz, enjoys art and artists, enjoys herself, and enjoys helping to bring things to life. Mouser is but one of many residents of Inworldz who share these common traits, a common thread of altruism. Spend a few hours in Inworldz and you will see what I am talking about. It is evident from the moment you first rez in Inworldz, and are greeted not by opportunists, but by nurturing volunteers. Take it from a cynical papa-grid refugee, Altruism is Dead, Long Live Altruism. Inworldz, is it for you? It's just come to light that owner of Major Islands, Scott Major, recently closed shop and pulled out of IW. According to the forums, his original plan was to wait until the last renters paid period was over but, unfortunately for the renters, it did not work that way. He closed down his sim, returned the objects to their owners, and scooted on out of IW. Why did this happen? Frustration is the only answer. Why was he frustrated enough to completely screw over his residents, who in turn are also residents of IW? Because IW is a pioneer world and crap happens. Sometimes it happens daily and often to the same cluster of sims. The founders try their hardest to keep up with the bugs, they work hard and fix things as they go along. But it's not an overnight process. They've never hidden that IW is a pioneer world. It's on the forums about sims crashing and needing restarts. It's on the forums when things break or lag is extremely high. Not only are the shoutouts for help there, but the founders themselves touching base with users who are having the issues. Anyone who decides to buy an entire sim (or even rent a parcel) needs to remember that Inworldz is a pioneer world. A person cannot own a sim in the papa grid, come to Inworldz, and think it's going to work the same exact way. It won't. Looks are deceiving and because we look so much like papa grid, we often forget the behavior is much different. A person needs patience and understanding when working and playing Inworldz. If you can't handle it, if you don't have the patience or the ability to simply log off when your level of annoyance starts to overwhelm you, then maybe Inworldz isn't right for you......yet. Be a responsible person and remember to do your research into a grid to make sure it's a good fit for you. That you're ready to take on a task that can make you pull your hair out and pound your fist on your desk sometimes. Inworldz has come very far but they do have a ways to go so do your research before buying. What we don't need here is people who decide to pull their toys and run home with no care that they left a whole bunch of people stranded and scrambling. Content Theft, Content Theft, Content Theft...say it three times and it must be true. At least that is the theory of some. If they say it, they claim it, they insist upon it, then it must be true. Right? One of the larger issues surrounding IW for some people isn't the grid maintenance, it's not the lack of Truth hair or the fact that the prims are so much more tiny or larger then papa grid. It's not the sims that crash, sometimes not being able to figure out the whys behind the crash for a few days. 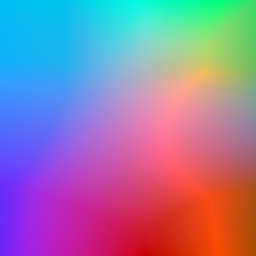 And it's definitely not the ever loving techno-color bug that makes avatars turn into sparkling rainbows. It's not an uncommon occurrence to sit in the IW coffee shop, welcoming new residents and a freshly minted person suddenly starts yelling from the freebie area "you stole this stuff!" at anyone willing to listen. These particular people are fond of traveling to different stores and laying into any poor soul who happens to be there claiming they are thieves and will be reported. Sometimes it's after they have de-ruthed themselves into the supposedly stolen content and other times it's done in ruth form. The more interesting part is when they say "That belly button on that skin looks like 'x' skin on papa grid. It's stolen! But I'm not telling...hey anything for good content." Before I get into whether or not IW has content theft, I would like lay down a few ground rules for content theft police people, here after referred to as CTPP. Please, if you wish to be taken seriously, at the very least don't use capital letters and shout at anyone. You have seriouz bizness and shouting gets you nowhere. Second, as a content creator myself, I would be mortified if those who liked my products started randomly accusing people based on leaf texture or belly buttons or any other likeness. By all means, drop a note card on the creator with your suspicions and let the creator handle it. I heard a story once where information was dropped on a creator in the papa grid about their alt in IW. You never know who is where and what name they are using. It's always best to keep things on the low lest you embarrass yourself or worse...give a bad name to the content creator you love so much by bad-mouthing their alt. Now for the Big Question: Does IW have content theft. Let me ask you this...does any virtual world have content theft? If I answer no, would I be lying to you? If I answer yes, would I have a residents of the world after me for lying to you? If I say I don't know...would I be speaking the truth? I'm going with the last one...at this point...I really don't know. IW has had content issues in the past and the founders have done take downs. They've had drama surrounding some content (due to refusing to take it down until alleged original creator came forward) and then took it down. As to whether they currently have stolen items on their grid...I really can't answer that. You can wave an object in front of my face and scream at me "EVERYONE KNOWS THIS IS 'enter x creator here'!" stomp your feet and demand that I accept it's content theft. The only response you're probably going to get is a blank stare as I tell you to contact the original creator so they can handle the issue properly. Probably because other then a few select creators on the papa grid, I really won't know one from another just because you do and I'm not going to assume others are as knowledgeable about content as you are. Inworldz takes content theft very seriously. If you suspect someone has stolen from another, please do the right thing and contact who you believe to be the original creator. Proper DMCAs must be filed in order to have a take down completed (rightfully so) and if something has not been taken down, then don't always assume the worst. Creators have no obligation to inform you of their alts, if the item was really theirs or just a similar product to one they make. It is not up to CTPP to decide if something is stolen or not and often, the more you scream about it, blog about it, and throw tantrums about it...the more horrible you look and less seriously you are taken by others. It also makes a mockery of real content theft and makes it that much harder for creators to be taken seriously when true theft actually occurs. Remember, Inworldz does not want stolen stuff on the grid any more then you do. Please handle the matter like the adults we are supposed to be and do the right thing by reporting it to the original creator. Anything else is immature and lacking of manners with no real accomplishments towards ending content theft. I logged in tonight to find two of my scripted objects were returned to me by the land manager where I live. The manager tells me that the scripts were killing the sim, so she had to return them. Fair enough. I don't want to be the cause of pain. Now comes the rub. The scripts in the troublesome objects have been running on this sim for just over 2 weeks without an issue. Today, there is an issue. Today they have suddenly become sim killers. What went wrong?? I learned that a patch was put into place on the server running the sim I live on. 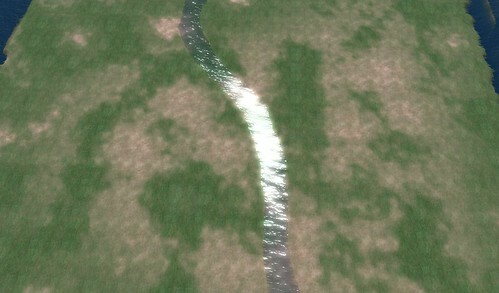 That patch it seems, changed the environment in such a way that my scripts suddenly became hostile to the environment. The result, was that the scripts were now, well on the way to killing the sim before they were returned. Do No Harm! Had I been selling this object in my shop, they could be spread all over the grid. If that were the case, as this new patch is distributed across the grid, several sims would be choked into submission by my now, rogue script. Rule #1: Do Not Break Existing Content - EVER. When I first entered into the papa grid, I found my way to a sand box and was promptly welcomed to the world, griefer style. I was shot, dragged, altered, kicked, beat and I think someone even held me up at gun point and demanded I hand over my bling. It was a scary time and I refused to go back to a sandbox with one exception, the Ivory Tower. 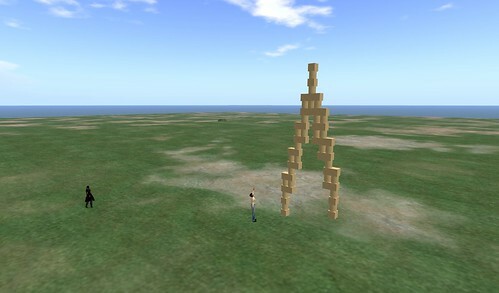 Inworldz has a cluster of four sandboxes for users to build their wares if they should need it. So today, I decided to venture back into a sandbox for the first time since my early days on the papa grid. Only this time, I was going to do it Inworldz style. I was pleasantly surprised to find a few people building and even more surprised to not get yelled at when I landed on one of their builds. Even though there wasn't much conversation going and the builders were spread out, it was still a pleasant visit. There were no griefers, no obscenities screamed back and forth and nobody asking me for money or trying to lure me to the darker side of virtual worlds. Which got me thinking....I've been active in Inworldz since the beginning of April. Not once has someone asked me for money, griefed me directly, or tried any pick up lines. Sure, IW themselves have been griefed and they have had problems with spamming at the coffee shop and possibly other issues that tend to plague virtual worlds; unless the founders step in and put a firm foot down. However, it's a pleasant surprise to think back and not remember one single time that I was directly harassed in ways that are all to familiar on the papa grid anytime someone leaves their private parcel. 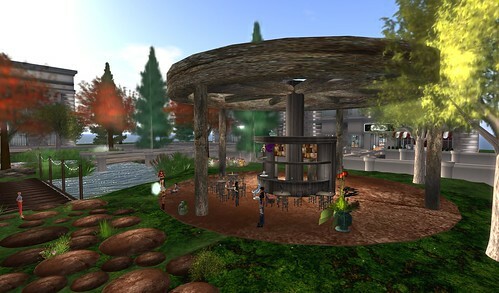 If your looking for a peaceful place to build, the Inworldz Sandboxes are easy to find the map by typing Inworldz Sandbox then teleporting over to begin your building adventure. When taking into consideration that Inworldz, up until about two months ago, was a relatively small community with around 1k users, the growth that has occurred is amazing. They are currently sitting at around 7k users. Sure, it's still small in comparison with papa grid and some of those 7k are alts, name savers, or people that were just not ready for IW and the pioneer spirit that requires patience and even more patience at times. Because of the small original community within IW and the needs/wants of the community at that time, diversity was minimal. There may have been a few furry avatars available or you could be a human. However, things...they are a-changing in IW with more and more content creators making their way into our once small community. They are bringing changes, concerns, and products that they hope the masses will enjoy and purchase. Others are bringing their expertise at building wonderful sims for the community to explore. There is no cost to explore the sims as they have been created out of kindness and add a much needed level of diversity to the world. One community, Raglan Shire, appears to have the patience, the enjoyment of pioneering, and the diversity to bring in a whole new level of user experience. I've always been familiar with tinies and own a few on the papa grid, but never heard of this amazing community until they burst into Inworldz full blast and started to create a home for their tiny friends. 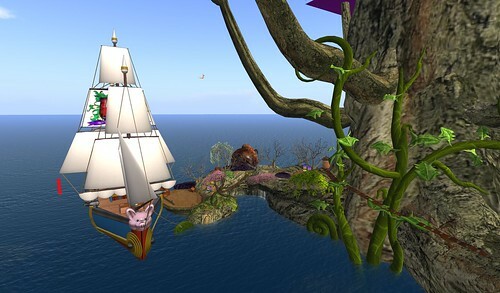 Ok, maybe it wasn't so dramatic that they burst in, but they are Inworldz, offering an amazing delightful sim full of whimsy and fun for exploring. The sim is centered around a huge magical tree that sits in the center with teleporters to take you to the many different areas. 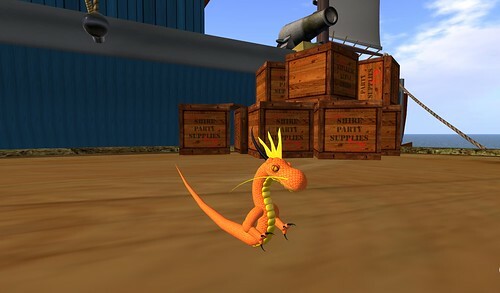 I met up with Zauber, a tiny dragon, by the ship and he explained that it took about two weeks to build as much as they have. By appearances, they do have a bit more to go, but watching the progress is one of the best things about seeing new sims come online. The diversity that Raglan Shire is bringing into the community has urged others to create tinies. Some for free and others at a cost, all are well done and a welcome addition to Inworldz. It's the special touches like creating a world for tinies so they have some place to go that makes Inworldz continue on it's path of supporting creators and their endeavors to use their imaginations to create a wonderful world in which we can live and play. I was sitting outside my local Starbucks slowly sipping a Grande Chai. A truck drove by. A big truck actually. A really big truck, which is sort of unusual for the neighborhood I live in. It was a Walmart truck. Big blue letters screaming Walmart. It stopped at a traffic light, so I got to stare at it for a moment and that is all it took. My mind flooded with images. I saw a big box outlet coming to town. No name on it mind you, it was a day dream and mine seldom have much detail. You know the story, mom-and-pop operators get a stick, and everyone else gets cheap crap. And just like all the stories you ever heard, everyone in town was excited about the big box's arrival, until they realized the hidden ugliness that comes with the big box. Some of my neighbors enthusiastically helped draw the attention of the big box outlet. They made lots of noise about how they wished they had more choices in what products they got to buy. Others worked day and night to ready the ground, that it would be ever so easy for the big box to set up. Still others started to save their pennies, so they could be the first to burst though the doors when the big box finally opened its doors. With time, the big box heard their cries, looked at how accommodating the community and its leadership was, and decided to come to town. I fear this scenario is unfolding in IW. We have wish lists in the forums, people pointing out what would make IW a more user friendly place, and we are growing in numbers. All of this is natural and I do not find fault in any of it. My only concern is that collectively, these activities sing a very sweet song. A song only the big box operators on papa grid can hear. Once enchanted, they will come, and they will come in droves. Some will welcome the big guys with open arms while others will feel the influx is turning IW into an extension of papa grid. It doesn't really matter. Once the big guys show up, the little guy will get the stick once again. Papa grid has issues getting the mainstream adoption it so desperately wants and needs due to two main factors: hardware hurdles and community fragmentation. What does this have to do with Inworldz immersion? Well, the hardware issues stay the same for all virtual worlds. Third party clients may run a bit lighter than officials, and Heritage Key has a web portal option now, yet these things alone do not overcome the hardware hurdle for OSGrid worlds. A web based viewer is needed for mainstream adoption. Accessibility is the heart of the mainstream. The community issues are the same as well. All grids after papa grid are in the unique position of being able to establish their niche from the start. All also have the trials and tribulations of papa as a living history lesson to study. What is the defining characteristic of Inworldz? Why should people make this grid their home? Papa grid made some big mistakes here. At first, his defining characteristic was community. Come join a community and build a new life in a 3D world, he called. Over time, though, it seems Papa has become all about the money; corporations and commerce. And all the pretexts and secret dealings that come with that focus. I doubt many would say that papa's grid is in a "state of love and trust". This revelation made me open to trying other worlds. A friend asked me to try out Inworldz with her. I read the TOS, I poked about on the forums, I registered an account. I waited for a time when the two people I knew were on, took the plunge, and rezzed in. The experience was altogether different than my rez in on papa grid. Instead of a fancy wasteland where I knew no one, I rezzed to a warm and inviting area, with two friends and a mentor saying hello. Everyone around us was chatty and open, both established residents and noobs like me. I logged out a few hours later, marveling at the feeling of possibility on this new grid. All because of an open community based on helping people, not selling them stuff. So imagine my surprise when I go to read ilivesl and find she has a different impression of Inworldz's overall focus. Now, there is a money system in place Inworldz, and there are shops, but I thought they were looking for a better, safer community-not a consumer haven. Maybe the advertisers that stand in the path of the newly rezzed over at the coffee shop have more place there than I. Maybe the mentors are so bent out of shape over residents hanging out at the coffee shop because they're marking territory. Maybe Inworldz is a place all about exclusionary corporate consumer culture. I hope not. I am worried, though-these trials are coming up so quickly. 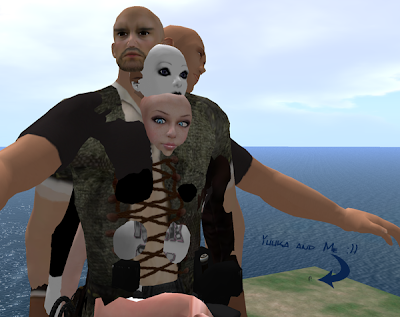 Most that make it over to Inworldz have been indoctrinated by papa grid. They assume it's all corporate. They assume the newly rezzed are consumers ripe for the picking. Let those of us that came here to feel a part of a greater community of help and beauty make the stand with you. Don't push us off IDI. That's a state of love and trust. That will bust down the pretexts of consumerism. Can the Lottery be Won? Are you a mentor or are you a volunteer? The answer for that would depend on who you speak with, their views on the subject, and what they hope to gain from the title. 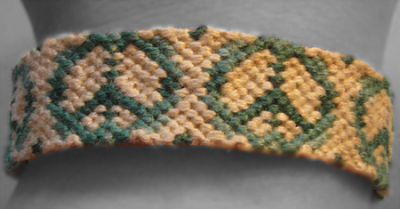 Can the two be combined and work for a community such as Inworldz? Tigerbeatle presented very valid points why it may not in her post, Winning the Lottery. However, my experience with such programs offers a differing opinion. If we look up the word volunteer in the dictionary, it offers a description of someone who performs a service willingly and without pay. If we couple that with mentor, which is a wise and trusted counselor or teacher, you have a combination of someone offering their knowledge without pay and for the better of the community as a whole. Recently, the forum community has been made aware of the mentoring program currently running the IW welcome center, The Coffee Shop, having internal issues. The exact issues at hand are unknown to me, as I am not a mentor. My knowledge, as with others that read the forums, is sketchy at best. However, this post isn't about the issues that plague the mentor group, it's about how a volunteer mentoring program can indeed work if a few things are taken into consideration. First, and probably most importantly, they need to make sure they keep any internal conflicts within the group off the main forums and out of the Coffee Shop. The community at large does not need or want to know about any personality conflicts, drama, or other issues arising from the mentor program. We want a happy coffee shop with mentors willing to help new and old residents as needed. The community does not care if Mentor A is having a problem with Mentor B or if Mentor C takes issue with policy 1, 2 and 3. We're human, we'll watch it just like we slow down and check out the accident on I-90 during rush hour. We don't want to look, but if you display it, we will. Then the community starts second guessing things and before you know it, a cluster is forming, feelings are getting hurt and confusion ensues. Founders are then left with the task of clearing the field of misunderstandings a few times over. It's not a pretty sight for anyone involved, as we have recently found out. The second important task is to make sure that the mentors volunteering their time are not there for their own personal gain. Yes, there is self satisfaction in mentoring, that's not what I'm referring to. 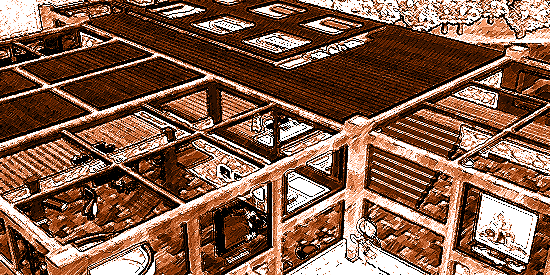 The coffee shop is a place to return to, visit with friends, take a moment to relax from building and also the first place all new residents see and experience. The people that frequent the coffee shop are not there for any one particular mentor. They are there for the atmosphere the mentor helps provide. The third task, probably one of the hardest of them all, is making sure that mentors are all on the same page regarding the rules and what will happen if the rules are broken by residents. Being a mentor isn't always about helping new residents, it's often about making sure the area is a safe haven for others to enjoy. By establishing clear cut rules on how to handle rule-breakers that every mentor must follow we can alleviate personal annoyances from coming into play. This also lends to the fact that there needs to be some sort of system in place for times when personal annoyances are over riding the clear cut rules. The fourth task is to not step on your residents toes while keeping the mentor group happy with their volunteering. Residents are often happy to share their knowledge with new residents, they are excited to see them rez in and gladly offer their assistance. This is a good thing, it ensures that the Coffee Shop is covered even if a mentor is not present. It also helps alleviate pressure on the mentors to assist every new arrival when they are at the coffee shop. In my world, there is no such thing as too much help. The last thing anyone wants to do is make residents feel as if they cannot speak, interact or help out a new resident if a mentor happens to be present. If there is one thing more harmful to the community, it's making residents feel unwelcome. Lastly, and I agree with TigerBeatle on this one hundred percent, is that there does need to be a hierchy; a boss, leaders and volunteers. The boss oversees and has final ruling on any internal conflicts, the leaders guide the volunteers on their day to day operations, making sure they are following the guidelines set forth by the boss and the volunteers who mentor new arrivals and help older residents as the need arises. Will there be drama occasionally? Will there be conflicts and the occasional mentor stomping off because what and how they want things are not happening? Yes, there will be. 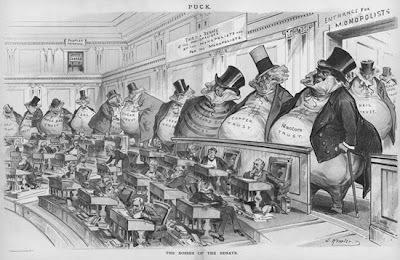 It's a group of people with differing opinions on how things should be run. Not everyone is going to get along and in all honesty...mentoring or the responsibilities that come with every aspect of it is not for everyone. The goal is to make sure the community is not witness to the train wreck and the coffee shop community is a safe haven for everyone to enjoy and to have fun. The founders and the mentoring program will find their feet. They have gone from a small world with few mentors to a large world with many mentors over a very short period of time. What they are experiencing now is growing pains. These hurt, but lessons will be learned and the mentoring program on a volunteer basis will work. Often those who volunteer their time do it because they love to help others. Not for fame, fortune or notoriety. They simply want to help, which is why such groups, if run properly and once out of the growing pain stage, work very well. Is it just me or has anyone else noticed that inventory is loading faster? It seems to me that I used to have to wait for what seemed minutes, before I was able to get at some landmark I was after. Now that I think about it, I used to have to actually go looking for something before the inventory would load. Now it loads when I log into Inworldz without my having to even go into it. This is a vast improvement that I believe has slipped by unnoticed. While it isn't the ideal condition of inventory being persistent between logins, it is a start along that path and I applaud its silent implementation. Running a mentoring operation is typically expensive. Inworldz has avoided this expense by getting people to volunteer for their mentoring program, which is fine, as long as the entire mentoring staff are not volunteers. This is one area where Inworldz management team's lack of experience shows though. They actually expected the mentoring group to be self sustaining, with near zero conflict, while they reaped the rewards of the group's efforts. All this with little to no investment in the group. Sounds like hitting the lottery. Unfortunately, the Inworldz management team is learning that it is hard to win a lottery. While they are being schooled, the mentors themselves are paying yet another price. First their labors, ideas and time were greedily absorbed and now the mentors have to deal with the fallout of internal conflict, which had the group been properly organized, would have been avoided. Something for nothing is nice and can actually be pulled off in the short run; but to expect to continue to get free labor, ideas, and momentum without a proportional outlay shows a lack of understanding of group dynamics, organizational management, and human nature. The all volunteer mentoring program needs to end today, and be replaced with a hybrid where some key members are paid Inworldz staff with both policing and policy powers; which are used to guide the volunteers. This will go a long way in controlling internal conflict while showing the community at large management's commitment to the program. Can Inworldz Learn From History? It has to happen as surely as the sun rising in the east. Give a group of people near total freedom or, as in virtual worlds, a sense of total freedom, and some will opt for anti-social behavior. It has always been like this and it will always be like this whether you are in real life or in a virtual world. To think otherwise is folly. Inworldz is not the first MMO to draw the attention of griefers, nor will it be the last. Inworldz is slowly becoming ripe pickings, for just such an influx of disgruntled, disenfranchised or otherwise troubled personality types. This isn't to say all griefers are socially dysfunctional, but the anecdotal evidence seems to suggest that the majority of griefers are, at the very least, malcontents. With the increasing incident rate of griefers on the Inworldz grid, the Inworldz community and governance body will be challenged both tactically and strategically in their efforts to minimize the disruption caused by the griefer's antics. This is where Inworldz must learn from history and avoid the mistakes of other MMO's before them. While Inworldz cannot completely control the actions of the community, Inworldz can and must develop an appropriate stance well before griefing becomes an institution within their borders. From a governance standpoint, we need only look back into history briefly for examples of how not to deal with griefers. Linden Lab first took a hands off approach, believing the problem would simply go away with time. When this failed, they set up some crude and obtuse guidelines on how to discipline offenders and then, finally, they opted to join with the community in its policing activities. They arrived at what the lab believes to be a workable solution, but the company took a heavy credibility hit along the path. There are many, myself included, that to this day distrust the Lindens over their handling of griefers. Reading over the transcript of the last Inworldz Mentor's meeting sent a chill along my spine as I saw within the typical ramblings, seeds of what could become the foundations of institutions like the "Sim Shadow Government" (SSG) found in the now defunct “The Sims Online” or the “Justice League Unlimited” (JLU). Both of these organizations were founded to combat griefers. While well intentioned, in my assessment, they both caused more harm than good. Vigilante groups such as SSG and JLU get their start by community members first voicing unease with griefers, then once their voice finds other like minded voices, they come together to form a group. Naturally such a group needs to have meetings and to protect any strategic advantage they may develop, these meetings must be held in secret. For the group to have any real power it must also forge an alliance with the governing body, else their only real recourse is to employ the same tools griefers use. The trouble here is three fold, hidden group meetings tend to breed suspicion by those not invited, and it allows radical or repressive ideas to be more easily accepted by the group. Finally, a secret community group with membership that includes employees of the governing organization has disproportional influence. In reading the Mentor's Meeting notes, I saw evidence of such a group forming as a byproduct of the mentor's good intentions in protecting the community from griefers. Don't get me wrong, I believe the Inworldz Mentor group is doing wonderful things and should continue to do so, however, I do see the start of what could become yet another secret group - and this must be avoided. The group has decided to develop secret communications tools via private areas in the forums. This is an innocuous development on the surface, but considering historic patterns in MMO's, it should be avoided. What gives me greater pause is the unique relationship the mentor's have with the founders. If there were ever a reason to not go private, this cozy relationship would be it. Nothing the founders do with a small subset of the community should be secretive, else the founders risk alienating the community at large. Another thing of note from the Mentor's Meeting notes is the tendency of its members to voice, without chide from other members, objections to various interest groups such as vamps or furries. As a half Drow, I can only wonder what they think of my dark ways. The point is, while the group members have a right to their own views, as does the group as a whole, their close association with the Inworldz governing body casts these views upon the founders, like it or not. Just being a part of the Mentor's group ties the grid founders to the perceptions the community holds of the group as a whole. In fairness, during the meeting Legion voiced opposition to segregation or discriminatory trends and stated a neutral position repeatedly, which is commendable. Yet while his voice was strong, so were others with more restrictive viewpoints. History is always there to teach us the lessons we need to overcome our obstacles. This is true in life and no less so in a virtual life. We need to know our history and be wise enough to head its lessons. Look at the ugly histories associated with the Sim's Online and their SSG or the JLU and learn from them. Keep meetings and communications as open to the public as possible, and avoid the temptation of injecting personal preference into any rules, recommendations, or courses of action. The Inworldz founders would be well advised to avoid getting too close to one group, and never allow one group to have either greater voice or access, or the credibility of the governing body will be quickly called into question. We have all been there and if you haven't yet you will soon. Nothing like logging into Inworldz and having your avatar dressed in the latest from the Swiss cheese factory. That is right, I am talking about when your textured self is all exposed to the wind like some sort of aged honeycomb. While for the first few minutes its all a big fun fest, that enjoyment quickly turns to annoyance once you realize your avatar is going to stay that way until you take action. So what can you do? Well there are a few things you can try which will force a redraw of the textures and hopefully you will be spared the drudgery of logging off and then back on in hopes of avoiding the holey textures on your next trip. The first thing I would try is to force a re-bake of the textures. You can either navigate though the menu system (the location varies with each viewer) or you can simply type Ctrl-Alt-r. Make sure you press all three keys at the same time. Give it about a minute or two before deciding this didn't work, because it can take a bit before you notice a change. If this still hasn't worked, then you can try jumping into Appearance Mode for a few seconds and then back out-but to be honest I haven't had a lot of success with this work-around. So you have re-baked and you have jumped in and out of appearance six times and still your innards are your outtards. Well, then, the only thing left to do is to log out and come back in. This almost always clears the Swiss cheese effect, but it is a total pain in the clicking finger to do so. Such is the price for living in the Wide Wild West of InWorldz. Finally took some pictures of Inworldz today, beyond the random shot at the Cafe near the entry point. Actual writing can come tomorrow, along with captioning. Need to see the site with some sort of content up before I can sleep happily. In other news, I now have a seat, desk, and laptop in YWC headquarters on Blues Island. Now all I need to do is find a texture that looks close to a Commodore 64's casing, or break down and make one myself in GIMP. Tomorrow. Tonight, I smoke a pipe and sleep. Any sculpt makers out there that want to make a pipe, let me know. Though learning Blender may be in my future as I settle on this grid. I want pipes and glasses and trees and writing animations, darn it!